Tantalus Quartet has dazzled audiences across the globe with their warm stage presence, their “perfect ensemble” (Reinischer Post, Germany). 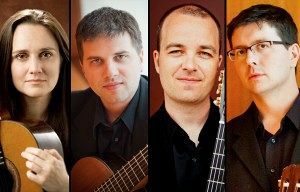 Tantalus expands the boundaries the traditional guitar quartet with new music by award-winning composers among “diverse and original" programming (Richard Long, Soundboard). This tradition continues with their second CD release: Foolish Fire, featuring world-premiere recordings of original works written for the Quartet. Tantalus maintains an active performing schedule, and has appeared at important venues including Carnegie Hall, the Guitar Foundation of America Convention, the Mostly Music Series Chicago, Iserlohn International Guitar Symposium (Germany), Silesian Guitar Autumn (Poland), Acadia International Guitar Festival (Canada), and many others. Tantalus Quartet is: Kristian Anderson, Stephen Mattingly, Lynn McGrath and Sungmin Shin. Tantalus performs on D’Addario strings.